KDC posted details of Knowsley Council’s draft of a new travel support policy which would help to decide who could apply for support from the Council to enable them to travel to education, training or social care services. The Council was providing travel support to a number of people who qualified for help with travel so they could access services. That support could include providing financial assistance to purchase a bus pass, or arranging for a mini bus, taxi or private hire vehicle to take individuals directly to a service. 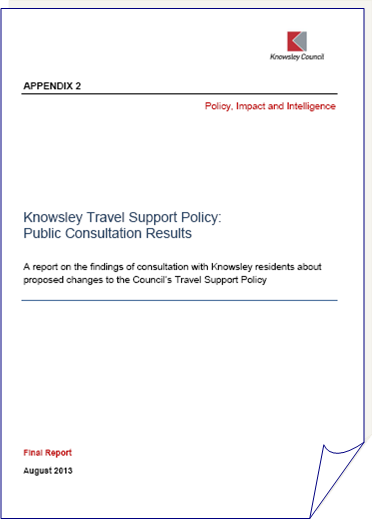 The new travel support policy proposed to change the way that the Council provided travel support across Knowsley, below is the outcome of the consultation. If you have any queries in regard to the document please email us here at info@kdc.org.uk with the reference Travel Support.